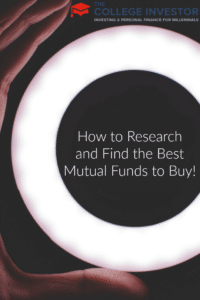 Home » How to Research and Find the Best Mutual Funds to Buy! If you’re like the majority of the population, you hardly even know what a mutual fund is let alone know how to find a good one. If you have your 401(k) set up through your employer, then you most likely have a very small selection of funds to choose from. If this is the case though, I can still help you find a great one with just a few quick checks. For those of you that are looking to invest in funds on your own or through a private broker, then you have quite a number of different mutual funds to choose from! In fact, if you decide to invest through a medium such as Scottrade, you can find hundreds if not thousands of different mutual funds! So where on earth do you start? And how do you know if you found a good one? There aren’t too many people that blindly throw their money into the market these days. They might not have a lot to go on, but at least there is a method to their investments. For the most part, it’s wise to first think about a particular market segment that you believe will do well in the future. For instance, since there are quite a few baby boomers that are reaching retirement age, you might want to invest in something that’s medically related, so start your search with that. You’ll still find plenty of options in that particular segment, but you’ll narrow down your overall options enough to dig down and perform some more in-depth analysis on various funds. Remember, even in segments, there are different fund choices. For example, you can have an equal-weighted index fund, or a capitalization-weighted index fund. The difference matters! Traditional investors (which includes myself) believe that a mutual fund should have a proven track record before they choose to invest their hard-earned dollars into that particular fund. In an up market, I figure that a fund should have a yearly earnings of at least what the major indexes return. In a down market, they should still be better off than the indexes. Overall, I like to see a mutual fund that averages a better return each year than the market. I know this sounds high, but with so many mutual fund options, you should be able to find this. Just like CEOs, these fund managers can’t escape their past. If they ran a fund into the ground a few years back, it’s now part of their track record and they can’t hide it. I suggest that you find the name of the fund manager and just do a quick search on their name. If they have had previous funds that they’ve managed, how well did they do? If they have a great track record and everything else checks out, then this might just be the right investment for you. Ever since 2005, the fund managers are required to disclose how much they are investing in their own fund. Their reports aren’t in exact dollars, but they are in seven different increments from $0 to $1 million, so you should have a pretty good idea how confident the manager is in his own abilities. The more they invest in themselves, the more comfortable you can feel with their fund. After all, when you have your own money at stake in a particular project, you take quite an interest in it don’t you? That’s the same idea here. If the manager is investing a large amount of money, then he’s going to do everything in his power to make that fund increase in value! Every fund has a slightly different load and fee policy. Some funds have front-end loads, some have back-end loads, and others just have fees with no loads. If you find a fund that has a “load,” that really just means that there is a percentage fee either at the front end (when you buy the fund) or at the back end (when you sell the fund). Preferably, you’d like to find a fund with a low percentage fee and doesn’t have any loads. This will minimize the expenses that you will pay during the full term that you are invested in this fund. We typical Americans always think that bigger is better, but when you’re looking for mutual funds, this is typically not the case. Here’s why. The SEC has a limit on the number of shares a fund can purchase of any particular stock. If the fund continually gets more and more assets, there might more money than what the fund manager has interest in investing. In other words, the manager might really like the prospects of one particular stock, but because he’s reached his limit on how many shares he can purchase of that stock, he’ll now have to invest in something else, which he doesn’t have as much interest in. Therefore, when a fund gets too big, much of the investments might go toward shares that would never have been purchased if it were smaller, but the money has to go somewhere, so there it is. Bigger is not always better. Especially in situations like these. Just by reading this one article, you now know more about mutual fund investing than 95% (or more) of the population. All you have to do is head out to a website that offers a wide variety of funds, narrow down your search into a specific segment (or groups of segments), and then begin to dig into each fund that looks good to you. A good starting point is the Best Mutual Funds list by US News & World Report. Use the tools you learned here, and apply them to that list. Does it have a strong history? Has it been around a while? Who is managing the fund? Do they have a good track record? Are they investing any of their own money into the fund? How big is the fund? And finally, is the size of the fund larger than average? I know this seems like a lot of questions to answer, but the answer to each of them can be easily found online. Invest wisely, research your funds, and you’ll be just fine. Happy investing! What do you look for when trying to find the best mutual funds? My name is Kathleen. I’m graduating from high school and I’ll be off to college in the fall. I read your article and was wondering what your advice would be for someone who’s looking to invest while in college? I’ve been looking into Roth IRAs and stocks. (I work part time, but my employer doesn’t offer 401(k)s. I work at a concession stand.) Your advice would be greatly appreciated.